Covergirl Ready Set Gorgeous Foundation - I'm a sucker for Covergirl foundations (always have been), so I had to give this new formulation a shot, and I love it! It stays all day, doesn't break me out, and gives me medium coverage that's buildable. I did a full review of this drugstore foundation here. 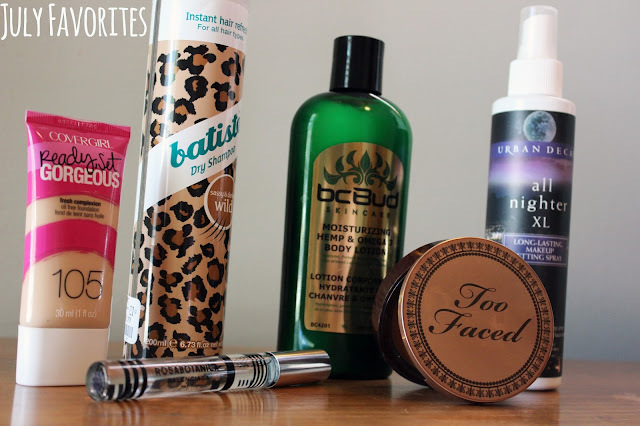 Batiste Dry Shampoo in Wild - I love Batiste dry shampoos, they are my absolute favorite. With all the busy work days and jam packed weekends that July brought, this stuff was my best friend. Girl doesn't have time to wash her hair every day, ya know?! Wild is my favorite scent, it smells like fancy perfume. Highly recommend it. See how it held up in my Battle of the Dry Shampoos here. Balenciaga Rosabotanica Perfume - This perfume is hands down AMAZING. It's not for everyone, but I could easily make it my signature scent. It's rosy, but not overly so. It has a sweet hint, with a mix of citrus and woods as well. It's unlike anything I've ever smelled, and believe me -- I've smelled a LOT of perfume. bc Bud Moisturizing Hemp & Omega 3 Body Lotion* - This lotion is super moisturizing and has a pleasant light scent. It's formulated with 98% natural ingredients and is free of parabens, SLS, harsh chemicals and is cruelty free. I really like the formula and I especially like that it isn't so strongly scented that I can always wear a perfume with it. Love! Too Faced Milk Chocolate Soleil Bronzer - I've raved about this bronzer before, and I still think it's 100% fabulous. It's matte, it doesn't make my face look muddy, and the best part? It actually smells like chocolate. I like to use this best when I've self tanned, as it's a bit too much for my natural uber-white self. Urban Decay All Nighter XL Makeup Setting Spray - I got this XL size ages ago, and I'm not even sure they sell it in this size anymore, but regardless -- this stuff rocks. I use it when I'm all done with my makeup. I just spritz my face and it lets my makeup sit more naturally on my skin, and it helps it last all day long. What are your favorites this month? Have you used any of these products? Let me know! *Product sent to me for review. See disclosures for my review policies. All opinions are my own. I only recommend products I truly believe are great. I really want to try out that Covergirl foundation! Off to read your review right now!